Jeepers creepers, is it fun venturing over to the dark side of things! I love fall, and Halloween is a favorite of the family. We have all sorts of creepy decorations, fog machines, scary music and things to spook the neighborhood kids with. They love coming to our house to see what we come up with each year. Last year we made the courtyard and fountain into a graveyard with huge headstones and skeletal remains in the fountain with dry ice making an eerie fog over the walkway up to the house. When I started these pieces, (plus two others) I wanted them to look like they would fit into your normal decor, and only closer examination would reveal their true slightly scary side. The poor sisters, bound together by their dark secret, would remain chained to the house in which they were raised, forever, and ever, and ever…The Sisterhood with their vows of loyalty to each other and their craft, reside in this mansion that no one dares go near…It is so fun to think of the tales these pieces might tell anyone willing to take a closer look. 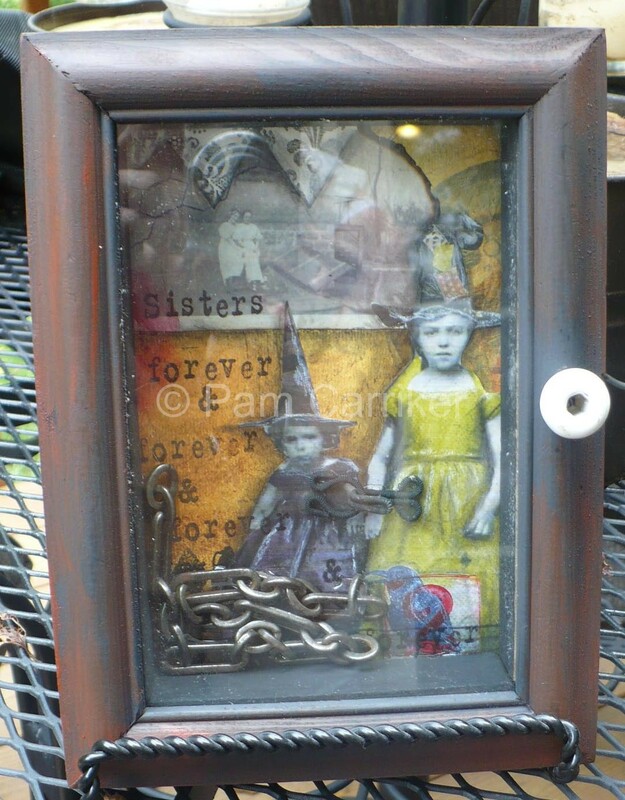 These shadowboxes and two more like them are my offerings for Halloween, available in my etsy shop. Scary stuff Pam!!! I love the quality and the feeling the colours evoke and I especially love those chains in the one of the 2 sisters!! I agree with Nancy–my boys would love to visit your haunted house!! 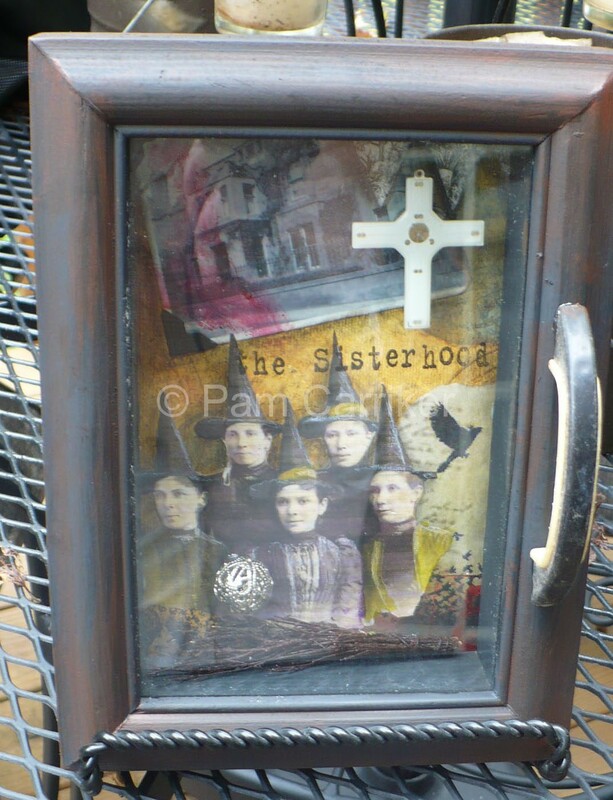 Halloween is so much fun, I agree–love your spooky shadow boxes!!! what else can i say? LOVE IT! I love them; great work!! Halloween is also my favorite! I really like your family pictures as well!